Hello everyone! Or shall I say.. BOO!!!! Who's excited for Halloween? I am. Can you tell? This year for Halloween I'm going to be sharing quite a few costume ideas with y'all; THREE individual ones to be exact & maybe, a couple group ones too... so stay tuned to find out! I already made one post on face makeup/paint ideas, so if you haven't seen that already then go check it out here. AND SPEAKING OF FACE PAINT, today's ideas are kind of similar. I did this one for all my gals who don't wanna go full out and transform themselves into something like a freaky (but badass) skeleton, but still want to participate and attend some Halloween parties. AHEM, HERES YOUR CHANCE TO SWITCH IT UP FROM THE BASIC CAT COSTUME, Y'ALL. I am showing you 3 snapchat filters you can recreate that are super easy, adorable, & give you the choice to either wear a themed outfit with, or just throw on a cute & trendy one. So this one is obviously the easiest of the bunch. 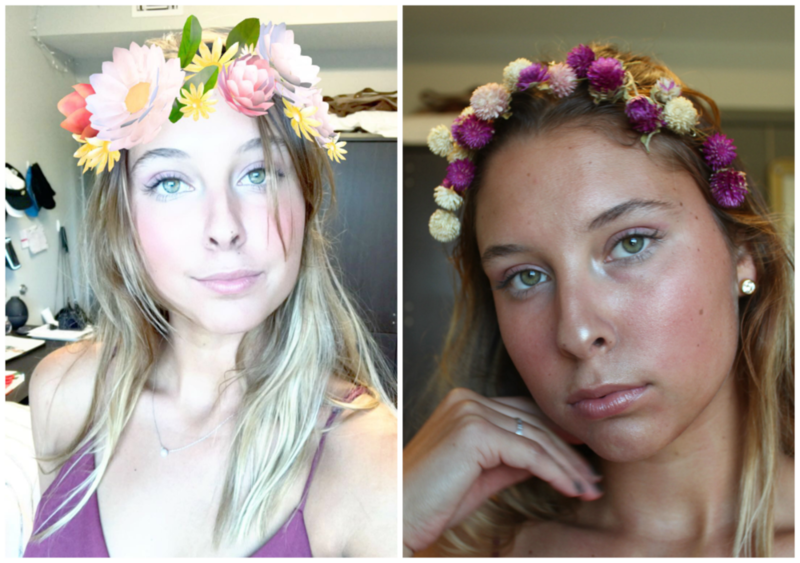 Just apply really natural makeup & a ton of highlighter to give you that pale/glowing effect like the filter does; however, it does involve purchasing either a flower crown or flowers to make the crown on your own. Tip: If you want real flowers, purchase dead ones. These are going to hold better and last longer. If not, just buy fake ones from Michael's, bobbi pin them in, & voilà! For your outfit, you can either wear all black and stick a snapchat sign to your shirt (so people really know what you are, lol) or throw something boho on to go along with it! I really really love this one guys, I just think it's so adorable! If you love animal costumes, definitely recreate this look. All you really need is a palette of colorful face paint (I got mine from cvs, so you don't need to go to a special halloween store) & a printer. 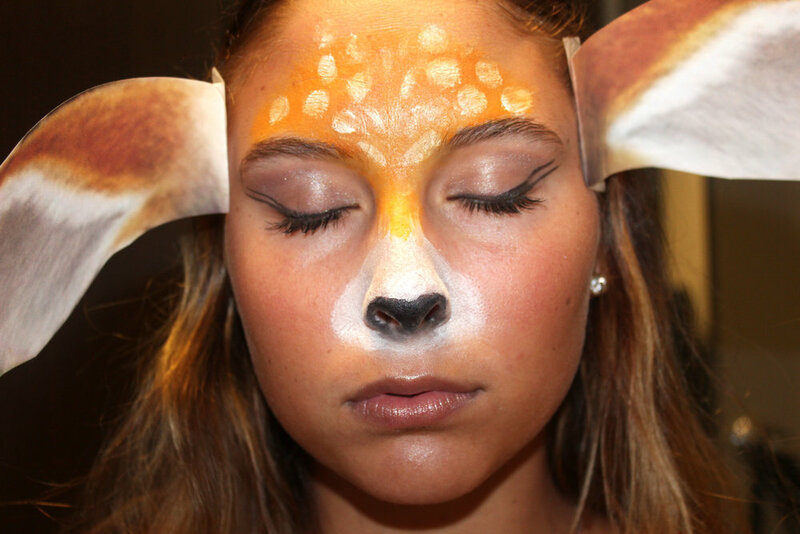 Once you've painted your face like the Bambi filter, print out a picture of the ears, take some double-sided tape & stick them to the side of your face! Don't make the same mistake I did; make sure your ears aren't too big because then they'll look way too overpowering like mine, haha. I think it'd be so cute to wear a tan t-shirt dress with this look, that way your outfit doesn't take away from your face paint! To achieve the rainbow ralf snap filter, all you have to do is again, work with a colorful paint palette once you've done a very natural makeup look. One thing I suggest is to take a white eyeliner to your waterline to get the effect that your eyes are bigger and then taking some highlighter or white eyeshadow to the inner corners of your eyelid! I found it easiest to just put the rainbow colors one by one on my fingers and drag down from my lips, so you don't even need a paintbrush! Tip: take a pencil and dip it in white paint to create the twinkles. I would either go all out and wear a rainbow outfit or I'd do a black outfit so my face stood out!